Lucinda Williams, Steve Earle, and Dwight Yoakam, three highly esteemed artists who have garnered 49 Grammy nominations combined over the span of their illustrious careers, have announced the LSD Tour. Sire Records recording artist King Leg will open the show as Special Guest. The North American tour, produced by Live Nation, unites three of music's most celebrated and iconic voices on one epic cross-country package for the very first time. Various pre-sales will begin March 26 at 10:00 A.M. local time. Tickets will go on sale to the general public starting March 30 at 10:00 A.M. local time at LiveNation.com. Click here for details. 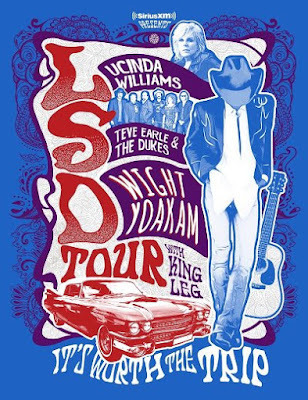 The LSD Tour kicking off June 12, 2018 at Blue Hills Bank Pavilion in Boston, MA, rolls through iconic amphitheaters and theaters in major markets across the country, and concludes on August 18, 2018 at Farm Bureau Insurance Lawn in Indianapolis, IN. SiriusXM will present the tour and recently announced a 24/7 channel curated by Dwight launching in late April titled Dwight Yoakam and The Bakersfield Beat 'Where Country Went Mod.' The channel will feature music from Yoakam's extensive career and celebrate the Bakersfield sound and those whom it has inspired. The channel will encompass all that is California country and country rock, in all of its various and varietal hybrid forms. Yoakam has sold more than 25 million albums worldwide, and he is a 21-time nominated, multiple Grammy Award winner. In addition to his musical career, Yoakam is a respected film and television actor, whose films include Sling Blade, Panic Room, David E. Kelley's Amazon series Goliath, and director Steven Soderbergh's feature Logan Lucky with Channing Tatum and Daniel Craig. Three-time Grammy Award-winning folk leader Lucinda Williams recently re-recorded her 1992 classic Sweet Old World for its 25th anniversary, and three-time Grammy Award recipient and Americana legend Steve Earle is also touring this year in support of Copperhead Road's 30th anniversary. King Leg's Sire Records debut Meet King Leg was co-produced by Dwight Yoakam and Chris Lord-Alge and made a major impact upon arrival. Rolling Stone touted Mr. Leg among "10 New Country Artists You Need To Know," while further acclaim came from HuffPost and more. The LSD Tour spotlights King Leg on the biggest stage yet. Finally, their respective paths cross and converge on the LSD Tour in 2018. 06/20 - Cincinnati, OH - PNC Pav. at Riverbend Music Ctr. 08/11 - Charlotte, NC - Charlotte Metro Credit Union Amp.